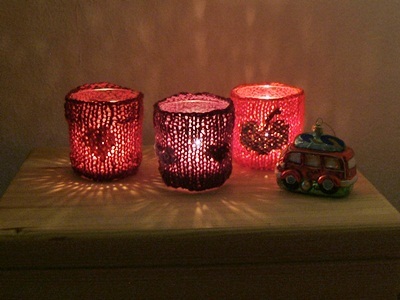 With easy to knit woollen tea light glass wrappers you get coloured tealight candleholders, which you can embroider according to the season. The knitted jackets for the tealight glasses are eye-candys during the day, a sweet touch of colour to your home, and when it turns dark outside and you light your candles they will cast gorgeous light. The knitted pattern paints great shadows on the wall and the wool colours give the candlelight a warm, cosy glow. Follow the pattern and make some sweet tealight candleholders. This winter decoration is easy and quick to make, most of you knitters will have all the necessary equipment at home. clear glasses, half size. For this decoration projects you can use your heavy used glasses, if they are chipped, have some scratches or are already turning a little grey, Your well loved glasses can begin a new retired live as tealight candle holders. 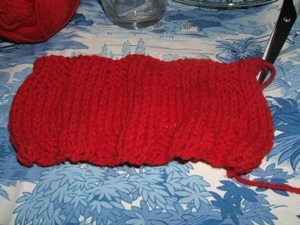 and to finish it up, again ribbing with 4 stitches knit, 4 purl stitches purl. With the ends you can sew the ends together to form a tealight holder mantle. It is okay to do it with a few stitches like 8-10. When your glasses are higher you might one to make the middle part longer. You do the ribbing to make sure the wool cover sticks to the glass and does not drop to the bottom. The middle part does not have to be as wide as the circumference of the glass., it can be a little shorter, as the knitted wrap stretches and the form of the knit stitch can be even better seen when the tealight casts its shadows. Your tea light glass candle holder with pretty shadowing effect will be a little more individual if you apply an embroidery. ...the tealgiths are ready in our pretty self made crochet basket. You start with embroidering after finishing the knitting piece before closing it to form the mantle. 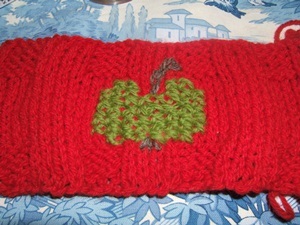 We applied smaller cross stitch designs from our patterns - here you can find the hearts and apple cross stitch pattern. To apply cross stitch on knit is not as easy as cross stitching on crochet - have a look at our crochet basket with embroidery pattern. The easiest way to cross stitch on nit is to stick in the needle into the yarn, you can even make crosses over 1,5 rows. 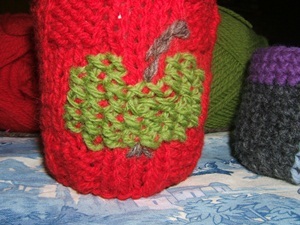 The small embroideries like the hearts are quick to make - give it a try. If you like to have some get together, gatherings and dinner parties during autumn and before Christmas you can use these tealight candleholder wrappers will make great table decoration, you can even enhance the shining and glitter if you use some Christmas tree decorations. You can use your tealight candleholder covers outdoors as colourful windlight. 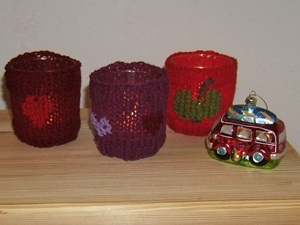 Tealight jar jackets can be made from woollen felt as well. Contrary to the knitted covers the wool felt covers up all the light for the candle you can cut some fine ornaments into the felt. If you want to try to knitfelt tea light candle holder wrappers try a very loose lace pattern with big holes already included. Great light for cosy evenings! 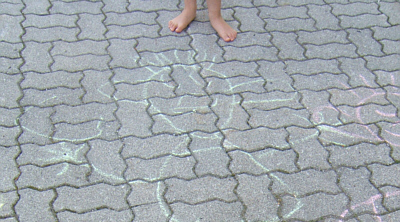 Have fun with this DIY project!